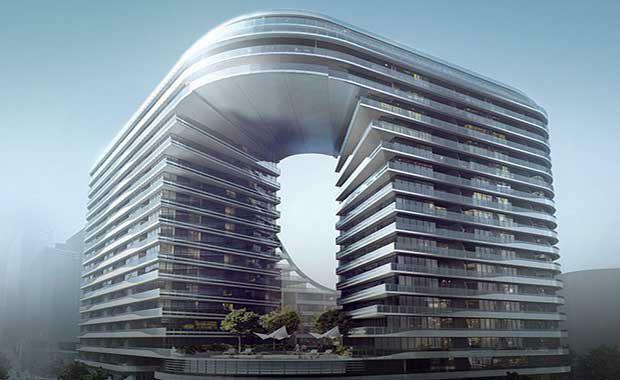 Crown Group is set to launch its $575 million development, Crown Green Square in Autumn 2015. The 20-storey development has already taken out the prestigious 2014 UDIA NSW Concept Design award, in recognition of the company’s dedication and hard work to create an innovative design for the important site in the heart of the revitalised Green Square precinct. Koichi Takada Architects, features curves that provide a smooth transition to the plaza and public domain spaces. Crown Group’s Chief Executive Officer Iwan Sunito said, “Our Green Square site is a unique opportunity for Crown Group to create a world-class development with architectural significance. Located at 301-303 Botany Road, the project features 401 apartments, ground-floor retail zone and resort-style amenities with gym, concierge and pool. The key focus of the building’s design is two intertwined loops that represent a visual connection between public and residential space. UDIA-NSW’s Chief Judge and urban engineer of almost 40 years Laurie Rose said Crown Group’s project will be a distinguished building proclaiming a new town centre in Sydney. “There are very few distinguishing buildings which proclaim one of Sydney’s most ambitious town centre initiatives, and while this project is still taking place it is clear this development will do just that,” said Mr Rose. “The proposed form of the building is principally based on retaining solar access to Green Square Plaza and library, along with an internal public courtyard which forms and open-air dining precinct. In selecting Crown Group for the UDIA award, judges commended the developer on its ability to blend a residential building with the enhancement of public spaces, providing a much-needed iconic structure to create one of Sydney’s most important centres. The Green Square Town Centre is the focal point of a broader planned $8 billion redevelopment of Green Square. By 2030, it is anticipated that Green Square will attract 40,000 new residents and 22,000 new workers. Mr Sunito says that the development aims to deliver a vibrant building and ground-floor zone where residents can shop, eat, play, live and relax. “The design incorporates a unique curved form and will feature the five-star resort style facilities for which Crown has become renowned,” Mr Sunito said. Construction is set to begin mid-2015 and is expected to conclude mid-2019.